Marioff has clearly demonstrated the superior fire protection capabil- ity of their Hi-Fog system in direct comparison tests in a simulated ship's cabin/corridor and public space. These tests were carried out over a period of three weeks at SP, the Swedish National Testing Insti- tute. During the test program rep- resentatives from the Scandinavian and UK Marine Authorities, to- gether with surveyors from classifi- cation societies were invited to wit- ness some of the 50 tests in which over 100 mattresses were destroyed. For the cabin tests piping was arranged so that both the cabin and corridor heads would release to- gether automatically if the glass release bulb in either was broken by the heat. This ensured that all the air being drawn into the room was completely saturated with water droplets. It also had the added ad- vantage of the fog blowing the smoke back into the cabin and contributing to a smoke level in the corridor of only 10 percent compared with the conventional sprinkler. The final test included typical "arsonist fires," and a flashover fire where the temperature in the cabin reached 900 degrees Celsius, yet was reduced to 50 degrees Celsius in less than three minutes. Most fires are difficult to detect at an early stage. A quick reaction depends upon the sensitivity of the detector and it is of great importance that the correct detector type is chosen. In the event of smouldering fire the optical smoke detector will be the ideal choice, a heat detector would in this case have less possibility to give alarm in time. Autronica's BS-100 DYFI system is a result of thorough research and 11 years of experience with analogue, addressable systems. In an analogue system the detector- chamber is constantly being monitored and every change in condition will be registered in the central. The fact that the detector has an address tells us the exact location of same. Autronica Marine, Drammensvn. 126, 0277 Oslo, Norway. Telephone: 47/2/55 34 10. Telefax: 47/2/55 30 46. Telex: 76274 amas n.
Autronica Marine, U.S.A. Inc., 234 Parkway, Northvale, N.J. 07647. P: 201-768-1886. F: 201-768-2570. 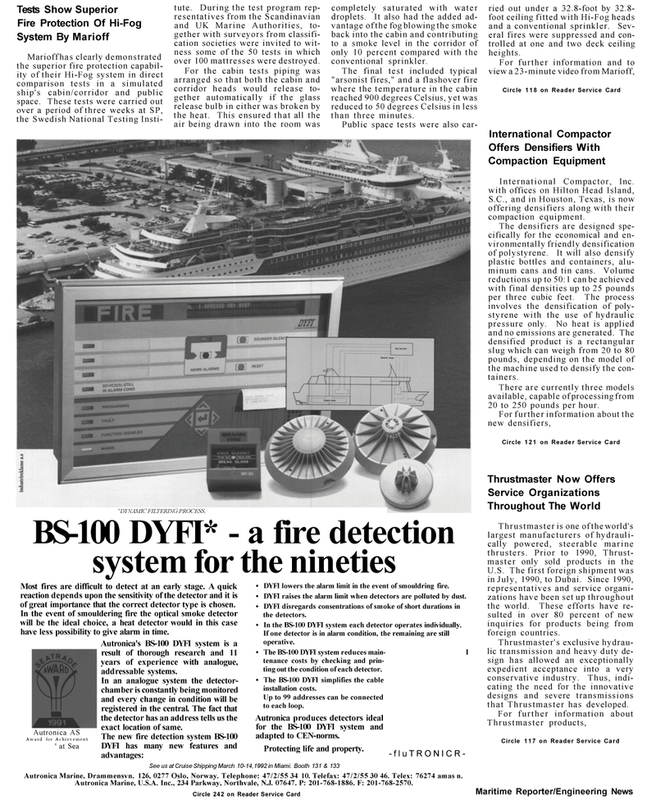 Award for Achievement ' at Sea • DYFI lowers the alarm limit in the event of smouldring fire. • DYFI raises the alarm limit when detectors are polluted by dust. • DYFI disregards consentrations of smoke of short durations in the detectors. • In the BS-100 DYFI system each detector operates individually. If one detector is in alarm condition, the remaining are still operative. • The BS-100 DYFI system reduces main- I tenance costs by checking and prin- ting out the condition of each detector. • The BS-100 DYFI simplifies the cable installation costs. Up to 99 addresses can be connected to each loop. Autronica produces detectors ideal for the BS-100 DYFI system and adapted to CEN-norms. Protecting life and property. -fluTRONICR- ried out under a 32.8-foot by 32.8- foot ceiling fitted with Hi-Fog heads and a conventional sprinkler. Sev- eral fires were suppressed and con- trolled at one and two deck ceiling heights. S.C., and in Houston, Texas, is now offering densifiers along with their compaction equipment. The densifiers are designed spe- cifically for the economical and en- vironmentally friendly densification of polystyrene. It will also densify plastic bottles and containers, alu- minum cans and tin cans. Volume reductions up to 50:1 can be achieved with final densities up to 25 pounds per three cubic feet. The process involves the densification of poly- styrene with the use of hydraulic pressure only. No heat is applied and no emissions are generated. The densified product is a rectangular slug which can weigh from 20 to 80 pounds, depending on the model of the machine used to densify the con- tainers. There are currently three models available, capable of processing from 20 to 250 pounds per hour. U.S. The first foreign shipment was in July, 1990, to Dubai. Since 1990, representatives and service organi- zations have been set up throughout the world. These efforts have re- sulted in over 80 percent of new inquiries for products being from foreign countries. Thrustmaster's exclusive hydrau- lic transmission and heavy duty de- sign has allowed an exceptionally expedient acceptance into a very conservative industry. Thus, indi- cating the need for the innovative designs and severe transmissions that Thrustmaster has developed.